It’s Saturday night and your friends ask you to go out for a cocktail. But, you can’t stop thinking…how the heck does alcohol and work with my PCOS? What drinks should I stay away from? Are there things I CAN drink that might be better for my PCOS? Or do I just need to sit there like a lump-on-a-log having no fun at all? 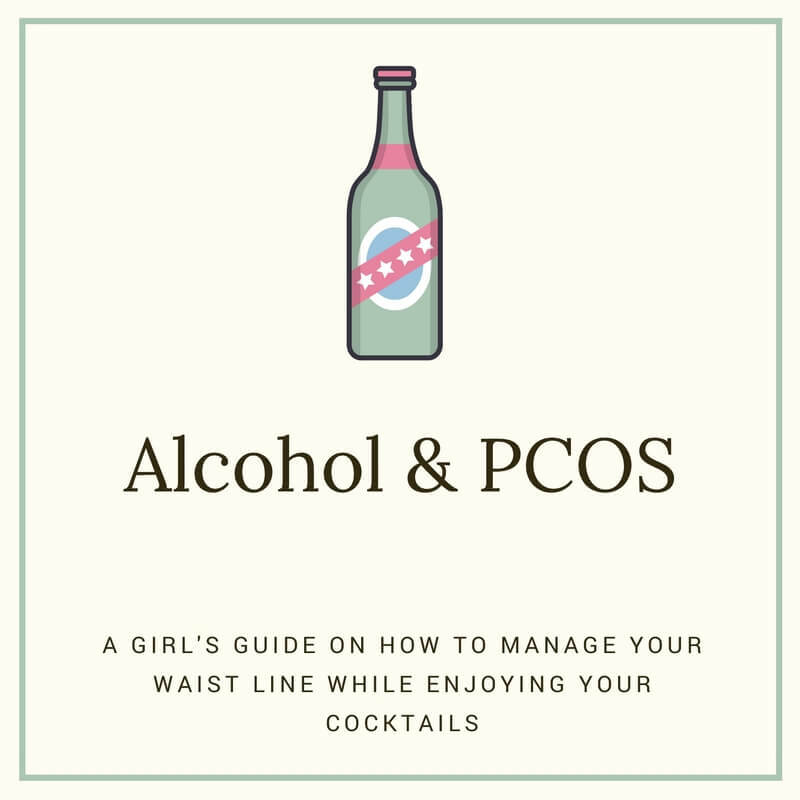 Fret not cysta’, I have all your answers and then some in my latest blog post on alcohol and PCOS. 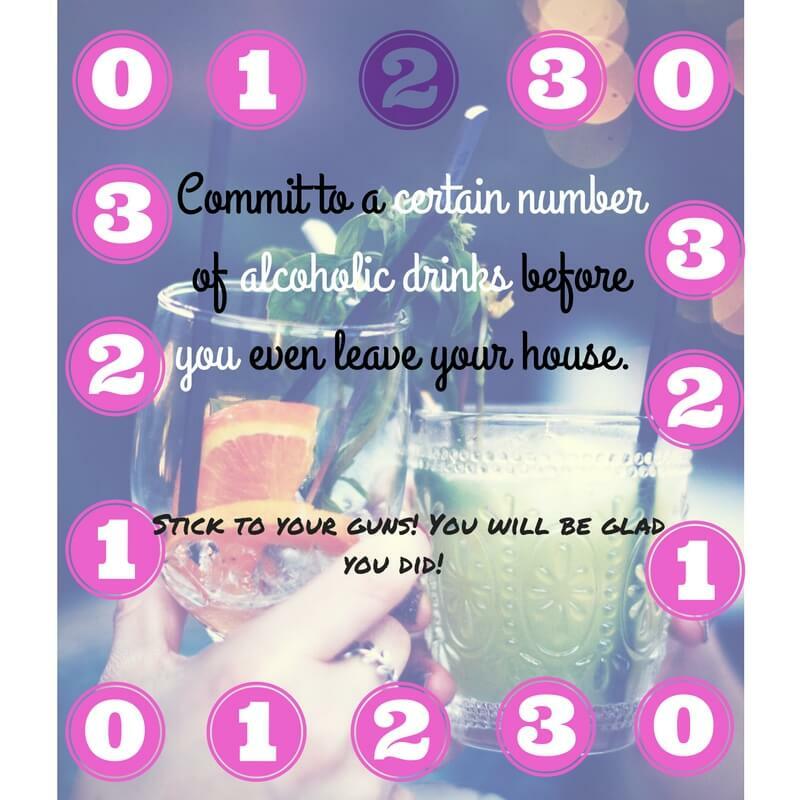 While I am certainly not encouraging you to party those cute little pants off, I want you to understand that having PCOS does not mean you have to give up the occasional drink. Here are a few simple tips for drinking alcohol without completely derailing your PCOS weight loss plan. Don’t drink on an empty stomach! Alcohol is absorbed much more rapidly when your stomach is empty. This means you will feel the effects of alcohol faster. Do yourself a favor and eat something with a modest amount of fat and protein before heading out to the bars. The protein and fat are digested slowly and act as a buffer for the alcohol. 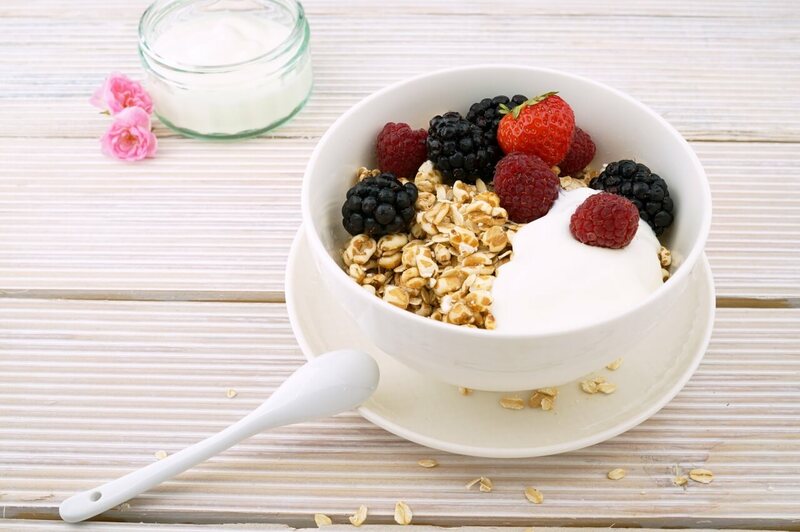 Combine a container of 2 % Greek Plain yogurt with 1/2 cup of berries and a sprinkling of granola and you have yourself an awesome “pre-game” snack! Good choices include a container of 2 % Greek yogurt with 1/2 cup of fruit and a tablespoon of granola. a serving of whole-wheat crackers and low-fat cheese or some yummy guacamole and raw veggies. Also by consuming a meal or snack before heading out, you may be more likely to stay away from the greasy, carby bar food that may be calling your name. We all know alcohol lowers our inhibitions. Almost as soon as alcohol enters the blood stream it can hijack lower one’s personal inhibitions. Yeah, it will make a person feel more relaxed and outgoing — but it also drops our inhibitions and prompts us eat many things we would not ordinarily eat if we were sober. Did somebody say nachos? pizza? Chinese food? How we LOVE you so after a couple of cocktails! ♥♥♥ But, if we are full and satisfied by our meal, we will not even want those tempting foods. 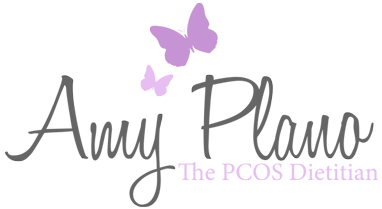 If you have PCOS there is a good chance you are on Metformin. 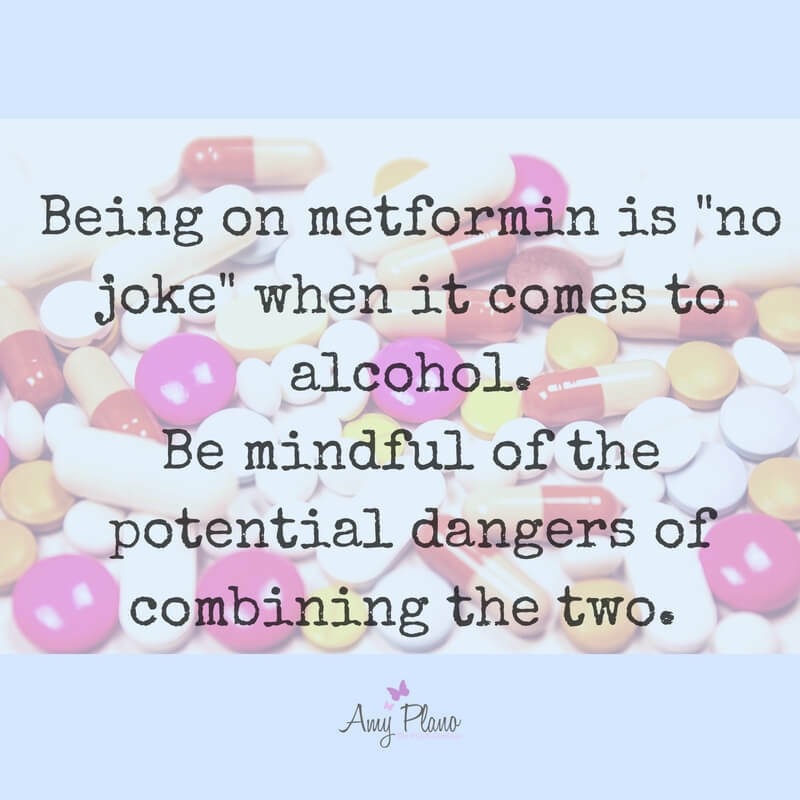 Metformin and alcohol don’t mix well at all. This is especially the case if you often drink a lot of alcohol or you binge drink (drink a lot in short periods). These effects include an extremely low blood sugar level, called hypoglycemia, and a condition called lactic acidosis. While lactic acidosis is rare, it can be serious. It’s caused by a buildup of lactic acid in your blood. When you take metformin, your body produces more lactic acid than it usually does. When you drink alcohol, your body can’t get rid of lactic acid as quickly. Drinking too much alcohol, especially with metformin, can cause a buildup of lactic acid. This buildup can cause serious damage to your kidneys, lungs, heart, and blood vessels. Therefore, if you anticipate a big night of drinking hold off on taking your metformin for at least 48 hours. Lactic acidosis is a serious emergency and not something to mess around with. If you take metformin and have been drinking and you notice these symptoms, call your doctor right away or go to the nearest hospital’s emergency room. Decide on how many drinks you are going to have AND what they will be. Share your plan with one of your friends who will be out with and have them hold you accountable. Stay away from the specialty cocktails or blended drinks. While these look delicious, most are very high in calories and sugar. 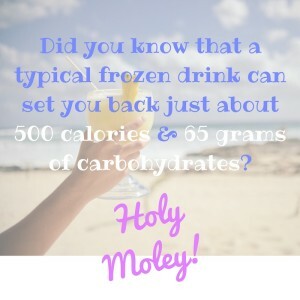 Some specialty drinks contain over 500 calories and 50 + grams of carbohydrates PER DRINK. Whoa Mama! Instead make better choices. Choose a light beer, glass of wine, or hard alcohol (gin/vodka/rum/tequila) on the rocks, with diet soda, or soda water and lime to save on calories and carbohydrates. All hard alcohol has no carbohydrates. It is the mixers (juices, syrups, regular soda) that contain all the carbohydrates. If you need more flavor than using the soda water and lime, ask for just a splash of juice and you will still significantly save on calories and carbohydrates. 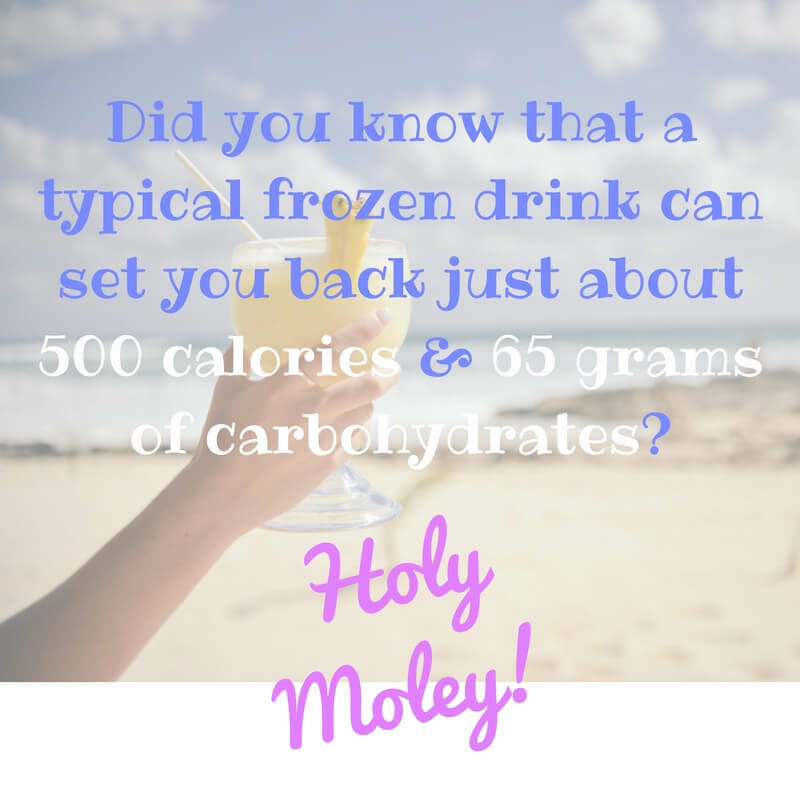 Frozen drinks pack a serious carb punch – coming in at around 65 grams of carbohydrates – pina coladas are one of the worst choices when it comes to alcohol and women with PCOS. Just because it is a clear liquid – don’t let the tonic water fool you. Tonic water has the same amount of calories and carbohydrates as regular soda. Boo! You’re better off sticking to soda water or diet soda. So now that you know what you cannot drink – let’s get down to business with what you CAN drink! I bet you did not even think there was such a thing! Well, girl friend the PCOS dietitian would not leave you hanging, right? The traditional mojito uses simple syrup for sweetening, but if you use a diet lemon-lime soda like Diet Sierra Mist or Diet Sprite, you can get all of the sweetness without all the carbs. Make it! Mix one shot (1.5 ounces) of rum with fresh lime juice and diet lemon lime soda. Pour over to muddled mint leaves with crushed ice. Oh I know we are already into Fall – but cannot we savor our summertime favorite — the gin and tonics just a little while longer? They’re crisp and cool, but like I mentioned above tonic water is loaded with carbs, with 21 grams per cup! Swap out regular club soda or flavored seltzer for your tonic, and you’ll get the flavor without hurting your waist line. Make it! Mix one shot (1.5 ounces) of gin with club soda water or seltzer water, a squeeze of lemon or lime. Serve over ice. Obviously, a regular cola would destroy your skimpy daily carbohydrate allowance. But diet soda lends itself to many carb-free cocktails. This spin on the traditional Jack & Coke simply uses Diet Coke instead. Make it! Mix one shot (1.5 ounces) of whiskey with Diet Coke. Serve over ice. Not to beat a dead horse, but it is no surprise when you are watching your carbs, you can make any simple favorite low-carb friendly using diet-soda. Despite its sweet flavor, rum contains zero carbs! Make it! Mix your favorite unflavored rum with diet coke and serve over ice. For an added twist, throw in a piece of lime. A Sea Breeze is a fruity, girly drink, but it doesn’t have to be loaded with sugar. Traditionally, it’s made with grapefruit juice, but using Diet Squirt or Fresca instead eliminates the extra carbs. Make it! Mix one shot (1.5 ounces) of vodka with 2 ounces of unsweetened cranberry juice and 4 ounces of Diet Squirt or Fresca. Pour over ice. If you like your wine cold and refreshing, Pinot Grigio is a good option without too many carbohydrates. There are about 123 calories and 3 grams of carbs in 5 ounces. Sauvignon Blanc also earns a place on your low-carb wine list clocking in at about 120 calories and three grams of carbohydrate per 5 ounce glass. If red wine is more your style, Pinot Noir is another fantastic lower-carb option. There are about 122 calories and 3.4 grams of carbohydrate per 5 ounce glass. It is no surprise that beer doesn’t typically make it on low-carb lists. Most are loaded with calories and carbohydrates. Some light beers, however, are PCOS friendly. Michelob Ultra tops the list as your lowest carb beer option. On one 12-oz bottle there are 95 calories and 2.6 grams of carbohydrate. If you need a little more flavor with your bubbles, Beck’s light beer might do the trick! It’s another certainly is a lower-carb options. For one 12-oz bottle you will be guzzling down only 63 calories and 3.8 grams of carbohydrates. Watching your carb intake doesn’t have to be torture! If you want to enjoy a drink now and then, choosing the right ones will make sure you don’t upset your PCOS related goals. Now, take this advice and go enjoy that drink with your friends! Alcohol can fit into a PCOS friendly diet with moderation and making smarter choices, which you my friend are now a pro at. This is such an awesome post. I’m not a big drinker at all, but I do like 2-3 drinks on the weekend and was always worried about having 3 wines blowing up my symptoms. This gives so much info & ideas on how to feel better about relaxing on a night out without compromising health. Love it!